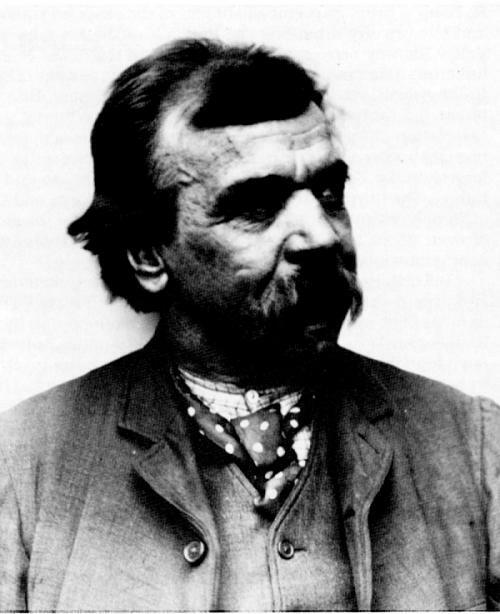 Bill o'th' Hoylus, real name William Wright, was born in 1836 at the Hoylus End houses at Hermit Hole which is where he got his pen name. It was on the 22nd day of March, 1836, in a village midway between Keighley and Haworth, in a cottage by the wayside, that I, William Wright, first saw light. The hamlet I have just alluded to was and now is known by the name of Hermit Hole: which name, by the way, is said to have been given to it owing to the fact that a once-upon-a-timeyfied hermit abided there. He attended the National School at Keighley, he left at the age of fourteen to learn warp-dressing at a local mill. Soon after he met a company of strolling actors which he joined for two years. He then joined the West York Rifles rising to rank of sergeant. Around 1859 he married and had three children. 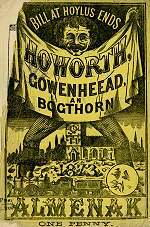 He wrote various pamphlets usually in a humorous Yorkshire dialect, some of his works are: History o' Haworth Railway in 1867, and his Howorth, Cowenheead, and Bogthorn Almenak in the 1870s. 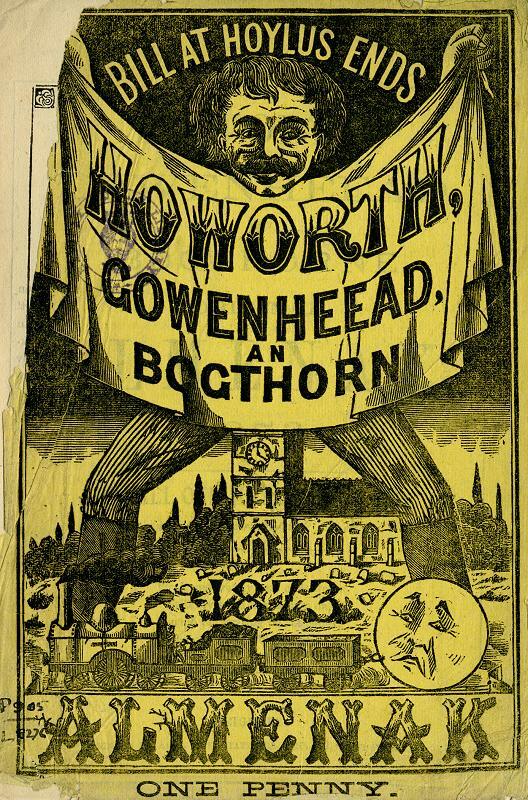 The front cover of his 1873 almanac (photo right) shows old Haworth Church, the Keighley and Worth Valley Railway and the moon; It was said that some of the men of Cowling (Cowenheead) tried to fish the moon out of a dam believing it was cheese. It was one morning while I was walking along Back-lane, at the top end of the town, that I "fell in luck." Old John Malloy kept a grocer's shop there - the Ship Inn now marks the spot - and I heard from him that he had a small litter of pigs. I saw them, and found among them a black pig - a puny, rickety, and most dejected-looking creature. I asked John what he would take for the best and the worst, and although he did not wish to part with the best pig, he was not very particular in that respect with regard to the worst - "the leetle blackie." For this he said he would take a shilling, and after bargaining with John I got the pig for ten-pence. we'll take this pig to Haworth, and show it as the War Pig from South America." John laughed at the idea, but heartily agreed with it. In the next place I got "on tick" a piece of calico several yards long, and with some lampblack I painted in bold type on the calico the words, "Come and see the War Pig from South America, 2d. each." Then Spencer and I engaged the large garret at the Fleece Inn, Haworth. I brought the pig out of the box, and exhibited the animal on a small table in the middle of the room. I introduced the war pig - "Ladies and gentlemen, - In opening the performance this evening, I have to show you the famous war pig from South America,"
There was an old fellow at the back of the room - a typical old cobbler. He pushed up to the table, and, after "eyeing" the "exhibit" somewhat critically through his spectacles, he held forth as follows:- "Nah, dus ta call thet a war pig?" in the vernacular peculiar to the natives. I said, "Did ta ivver see a war pig i' thi life?" "Noa," said he blankly "it's t' warst pig I ivver set mi een on." And then the audience saw where the "war" pig came in, and they laughed heartily over the joke. In't offices at Bored o' Helth at Howorth a few munths sin thay wor a feerful smell o' gas, so wun on em thowt he see if it let, an went reyt t't meeter we a leeted cannel in his hand, an tuke aht wun at screws, no sooiner had he dun so ner aht brust a leet abaat two yards long; this kaused a gert sensashun; all wor excitement an confushun, t'owd wimmin com runnin aht wi piggins full a watter ta sleck it aht, wun man set off ta Keethla fer t'fire engins, but wen he'd got ta t'Bockin he bethowt him he owt ta hev telegraffed an so he turned back an wen hed gat back he fun thay'd got it aht, by putting a seck ower t'hoil. He died on 21st July 1897 and is buried at Utley cemetery.